Peanut Butter . . . I love it! 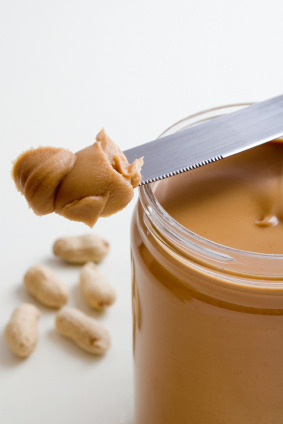 So, yesterday was National Peanut Butter Day, which of course is silly and superfluous but that’s not to say it’s a wonderful excuse for eating more peanut butter. I’m of the opinion that peanut butter is natures perfect food. Especially mixed with honey, molasses, maple syrup, and of course jam of any kind. When I think of cooking with peanut butter I usually go straight to cookies. I love me some peanut butter cookies. However, in light of the fact that I need to lose 25 pounds before my wedding in September, I decided to try to find another way to cook it and skip all of the calories. Here’s what I came up with. Chicken Satay Stir Fry. It was so yummy I was giggling and D thought it was something special too. I didn’t follow a bottle of peanut sauce or recipe, instead used what I had in the fridge. The essential ingredients for an “Asian” or “Chinese” sauce are: Fish Sauce, Soy Sauce, Hoisen, Sesame Oil, Chili Sauce, and Rice Vinegar. It’s impossible to achieve the appropriate flavor in your sauces without fish sauce, believe me I’ve tried. You might wrinkle your nose as such stuff and I assure you, you DO NOT want to see how it’s made. Just trust me when I say you can’t make a Chinese/Asian sauce without it. I found mine at an Asian market in Kansas City but Whole Foods, World Market and probably Trader Joe’s sell it. Buy it and keep it in stock (it lasts forever). Mix all ingredients together in a blender or with an immersion blender and set aside. I cut a large chicken breast into bite-size pieces, salt and pepper to taste and the juice of half a lemon. Brown the meat and set aside in oven to finish cooking on 225. Using any vegetables you like cook them until they are aldente then add back the chicken and half of the sauce. Toss until well coated and completely cooked. Serve on rice. I used snow peas, carrots, onions and red bell peppers. Just putting this together is making me hungry again. Dang it. Enjoy and let me know if you try it. 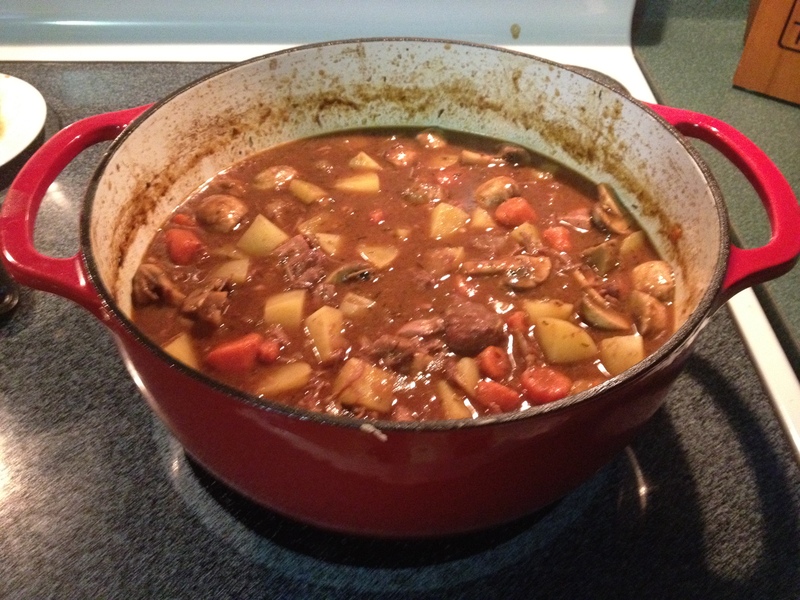 Use a good-quality, medium-bodied wine, such as a Cotes du Rhone or Pinot Noir, for this stew. Try to find beef that is well marbled white white veins of fat. Meat that is too lean will come out slightly dry. You can use 4 pounds of blade steaks, trimmed, instead of chuck-eye roast. While the blade steak will yield slightly thinner pieces after trimming, it should still be cut into 1 1/2-inch pieces. Look for salt pork that is roughly 75 percent lean. NOTE: I used just stew meat that was pre-cut and I used a bone in pork chop. Combine garlic and anchovies in small bowl; press with back of fork to form paste. Stir in tomato past and set aside. Pat meat dry with paper towels. Place flour and 1 tablespoon kosher salt into a large zip-lock bag. Cut meat into bite size pieces and shake in bag until fully coated. Brown the meat as directed above. Reduce heat to medium and return first batch of beef to pot. Stir in onion and carrots and cook, scraping bottom of pan to loosen browned bits, until onion is softened, 1 to 2 minutes. Add garlic mixture and cook, stirring constantly, until fragrant, about 30 seconds. Slowly add wine, scraping bottom of pan to loosen browned bits. Increase heat to high and simmer until wine is thickened and slightly reduced, about 2 minutes. Stir in remaining beef, broth, pork, bay leaves, and thyme. Bring to simmer, cover, transfer to oven, and cook for 1 1/2 hours. I had this ready several hours before needing to serve. After the first 1 1/2 hours I turned the heat down to 225 and cooked for another 1 1/2 hours. Remove pot from oven, remove and discard bay leaves and salt pork (or bones). Stir in potatoes, cover, return to oven, and cook until potatoes are almost tender, about 45 minutes. Using large spoon, skim excess fat from surface of stew. Stir in mushrooms, and pearl onions, and peas, if using; cook over medium heat until potatoes and onions are cooked through and fork slips easily in and out of beef (meat should not be falling apart unless you cook it as long as I did in which case it probably will, mine did), about 15 minutes. If you have questions about this email me and I’ll help you out. Enjoy! The man likes beef and lots of it. I’ve been told that the best beef stew should really only include one item. Beef. No potatoes, no carrots and for heaven sakes no peas! Unfortunately, stew such as that would be sorely missing in a myriad of ways. Once again I cracked open the Cook’s Illustrated cook book and found a recipe for Modern Beef Stew. It had some unusual ingredients in it and I was intrigued. It called for a paste comprised of garlic, tomato paste and of all things … anchovies. So, this a.m. I whipped it together with a few modifications. I don’t keep salt pork on hand and no packets of gelatin. I used flour and a bone in pork chop instead. I had to have mushrooms and potatoes but I did leave out the peas. I like peas in my stew but I didn’t have any on hand, they won’t be missed. You can’t make beef stew without red wine. Thank God for Charles Shaw’s Merlot. Two buck Chuck I love you! Here is what the result looked like. We shall see if D approves. I think it’s AMAZING! I’m going to serve this with a garnish of parsley, horseradish in sour cream. So, the holidays were crazy and I haven’t posted a single thing. Truth be told, I didn’t cook a single thing over the holiday. That was weird. Since we stayed at Derek’s parents there wasn’t much for me to cook. I wanted to cook but it’s weird to do so in someone else’s kitchen. My mother-in-law-to-be is a gracious host and a great cook so I have no complaints on that score (except she doesn’t keep horseradish in the house). I did show her how to make biscuits. It’s all in the baking powder, you have to use a lot of it! Oh and a touch of shortening helps too. January 9 is the anniversary of Derek finding me on Facebook. I celebrated by making one of D’s favorite foods, Gumbo. Cook’s Illustrated comes to the rescue AGAIN! I am telling you that there is nothing they do poorly. They are correct about the roux being the trick to good gumbo. I have been making roux’s a long time but I have never cooked a roux that long. It made the gumbo rich and layered in flavor. The Andouille sausage I used was also really good. It has come back to haunt me once and that’s amazing! 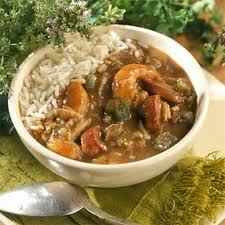 Shrimp & Andouille Sausage Gumbo! I didn’t have any okra to put in mine but I will next time. Yum-mee! We paired this with the 2004 Montebuena Pinot Noir. Wow! It’s our favorite right now. It’s so good! We also finally drank the champagne that was given to us at my going away party in KC. Chandon does a great champagne! I suppose I need to get a plan together for 2012 and I do have one. Get a job and get married that’s a big plan. Yippee!